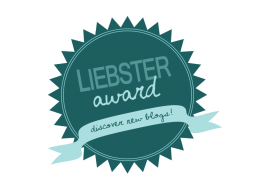 Thank you so much to Tracey Rains for nominating me for the Liebster Award. If you don’t know her blog, check it out at http://socratesunderground.com/. She is a high school English teacher, like my mom, so I automatically feel kinship to her. Her blog has insightful posts on today’s education mixed with personal tidbits about her life. If you have any interest in education her stuff is worth reading. (She also called me quirky and inspirational, so I adore her.) So now, onto her questions! If you could travel anywhere tomorrow, where would it be? I am itching to go to London, because my husband just returned there from work, and I haven’t been to the United Kingdom since he and I got married in Scotland ten years ago. What do you like about your hometown? I grew up just outside of Denver, Colorado. I love the mix of city life and outdoor life in Denver. When I was a kid we used to go to the theater downtown, and if you wanted dessert after a play you had to drive to a Village Inn or Perkins in the suburbs. Now we have a vibrant downtown less than 20 minutes from my favorite hiking trail. What is the simplest thing that makes you smile? My seven year old and her glorious sense of humor. Only she could make me smile by noting my haircut and telling me, “Well mom, I’m glad you didn’t get doll hair this time.” Doll hair? What is your favorite meal? Beef stew with dumplings on a snowy day. The whole house smells good all day and I enjoy the anticipation of the meal as much as the meal itself. Also, it’s even better the next day and I love leftovers. What’s your least favorite chore to do at home? I really, really dislike taking out the trash. What’s your favorite book? This is a question I feel the need to cheat on. I love so many books. I love paper books and audiobooks. I have a shelf where I keep my all time favorite paper books, other than Harry Potter. In the interest of answering the question, I’ll give you my favorite book I’ve read this year: The Bees by Laline Paull. It’s an amazing tale told from the perspective of a honey bee. It’s unique and a great story. Now I’ll cheat and say that the book that I recommend the most is The Martian by Andy Weir. If you have a geeky scientist non-reader in your life buy them this book. I am surrounded by geeky scientists and this book is a winner every single time. What is your most unusual or unexpected talent? I am a spreadsheet whiz. I even named my daughter using a 13 factor algorithm I built to analyze our name options. Who is your greatest hero or inspirational figure? My mom. She has taught me that it is never too late to make a drastic change in your life and do something you’ve never tried before. When she went back to school to become a teacher she was told she was too old to ever get a job. She didn’t think she could handle the math, but she proved herself wrong. It took a long time, but she finished her degree and went on to become a high school English teacher. I might think I was a crazy person for starting a writing career at 40, were it not for her example. What was your favorite game or toy as a child? Pink blankie, but I also loved pink baby and pink bear. I’m so grateful that my descriptive language capabilities have matured since childhood. What’s your favorite beverage? Diet Dr Pepper. Amie Writes – An aspiring writer who will consistently cheer up your weekend with her “Casual Friday” posts, which may appear any day from Friday to Sunday. I love the casual nature of her timing. When she’s not in a life transition, she’ll post some fiction from time to time too. Duck and Cover – A knitting blogger who will throw out great book recommendations if you ask her. Say Yes to the Mess – A brand new blog that is about a foster mom. I like what she’s done so far and love her topic. I hope she publishes more! Writing Blissfully – I’m addicted to the Between Breath and Suffocation series here. The characters are raw and the story is captivating. The Totally Serious Absolutely Professional Blog – If I am quirky Ditrie is quirky cubed. Go check out her beautiful new site layout and best ever tagline. Kwoted by K E Garland – Wait. She has 209 followers now? Nice work! Well she’s not eligible, but check her out. She’ll inspire you with pictures and quotes, and she’ll make you think about the world in a way you might not expect. She has a series of gut wrenching posts on the honest realities of conflict and healing in families that I recommend. Another non-eligible nominee (over 300 followers!) that I beg you to go read is A Funny Thing Happened when I was Learning Myself – She will make you laugh. I love her. And I ask these bloggers the following questions all centered around your personal process of writing. How do you do it, why do you do it, and what keeps you from doing it the best you could? (Tracey, I’d love to hear from you too!) Feel free to just use this as a prompt or ignore me as you wish. When is your favorite time of the day to write? What device do you prefer to write on or with? What is your favorite blog post you have ever written? What keeps you from realizing that dream? If you could have an hour with any author, who would you spend it with? Now for the rules stuff. I didn’t follow them all. Eleven questions is a lot, and I mentioned a few of my favorites with over 200 followers. I’m a blogging scofflaw! Socrates edition??? I’m totally flattered about anything that associates me with Socrates! Thanks Afthead! Your talent is pretty unique 😉 I’ll have to check out your other nominations. They sound pretty fantastic! Thank you for the shout out! This is the first time I have ever been bummed about having more than 200 followers. This would have been the first badge on my site after the one I put up for blogging101. I appreciate you thinking of me. I think it’s super fun that I have met a fellow Coloradan (is that how it’s spelled?) That also likes to laugh at the silly things in life. I might answer your questions anyway, just because it sounds fun. Thanks again! Ah! I’m glad I could nominate you and thrilled that awards are coming out of the woodwork for you! I’m also thrilled to have met another Coloradan (no red squiggly line there) and especially one who is so funny. Thanks for writing and sharing. I enjoy your stuff. No, I think this was still-in-the-box doll hair, before interaction with any real children occurs.